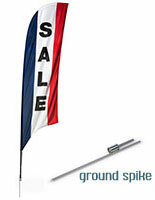 Retail locations can benefit from the use of these "SALE" message swooper flags! Each of the promotional signs feature a feather shape, which prevents the promo banners from curling up around the flagpole in the wind. The swooper flags, stand approximately 13ft. tall to stand out in any crowd and feature a car foot base to stay up in the wind. The dominating height of these color printed signs is sure to attract attention to any business! 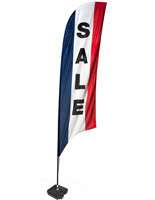 These advertising flags, such as flutter pennants, are designed for everyday use. The promotional business signs are made from a polyester knot-blend, for both durability and bright colors.